I am heading back to visit Israel again next month so I thought I would update you on my previous trip earlier in the year before I add to the backlog of posts to come. This post is showcasing places with the best views in the Holy Land aka Jerusalem. Jerusalem has been a place of pilgrimage and worship for Jews, Christians, and Muslims. I love that with each visit to Jerusalem I discover something new. I hope you enjoyed my discovery of Jerusalem’s Umbrella project in my recent post on Jerusalem’s Instrammable streets. Haas-Sherover and many other viewing decks in Jerusalem were all part of my discovery and adventures on the last visit to Israel. A visit to Jerusalem is not complete without visiting Western Wall and Dome of the Rock. In addition that you might also add places with the best views in Jerusalem. One such please with a great view of Jerusalem is Haas Sherover. I picked this place as it was said to be usually quiet and not too crowded with tourists. It didn’t disappoint as we were only sharing it was another couple who were too busy making out to notice anyone else and another lady lost in the world of a book sat on a bench. So I guess you could say we had this place to ourselves. 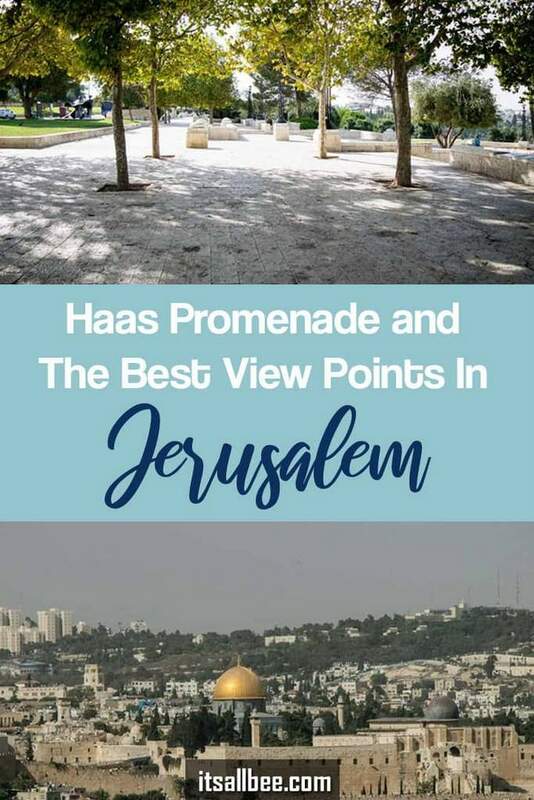 Hass-Sherover Promenade is full of little walkways, beautifully landscaped gardens, little balconies and the most beautiful views of Jerusalem. The best part is not sharing the place with many people. From here you get the view Mount Moriah where Dome of the Rock was built. Built on a site which the First and Second Temples once stood. You get to marvel at the beautiful city from Hass Promenade. You can also spot the beautiful golden Russian onion domes of the Church of Mary Magdalen. The Church of Accession can also be seen from here. It is quiet and serene and for a moment to forget the conflicts that are rooted at the heart of this land. This was the perfect spot to relax and for a moment the how beautiful the landscape in Jerusalem is. This was one of those unplanned visits as we had returned to Israel for that my husband could visit his mum who was in the hospital. We had driven to Jerusalem just to get his mind off things and I thought this place was the perfect spot to bring him to. Mount Scopus is another spot with great views of Jerusalem. 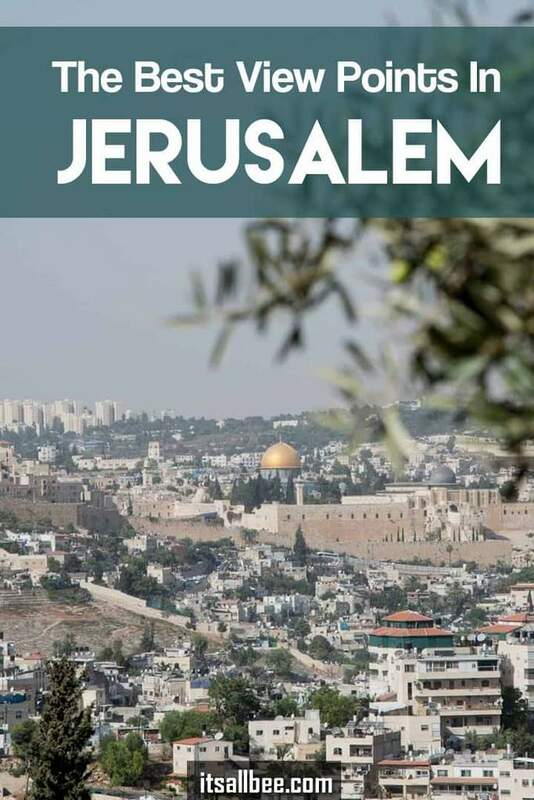 It’s also a couple of observation decks rolled in as you not only get views of the city’s vast landscape but most of the major tourist sites in Jerusalem mentioned above. In addition to that on a clear day, you can get a glimpse of the Dead Sea peaking out in the distant. Stunning scenery, what an amazing place. I can tell you must of really enjoyed your trip to the holy city, and no wonder you can’t wait to go back to these views of Jerusalem! I have always known it for its spiritual significance, its holy sites and nothing more. Your Jerusalem blog posts have revealed a new perspective of the holy land to me which is the beautiful scenery and great views from the pictures. Definitely. It is such a beautiful city beyond all that is holy site and all.